Branson Famous - Is Bad Press Really a Good Thing? I try to reserve articles for this Blog to feature things that I am really inspired by and so I wasn't sure if this was something that I was going to want to place here or not. The more I thought about it the more I realized that my inspiration for writing this would be the things surrounding something I wrote last night and some events that I have been a part of the last several months. Hang with me for just a minute and this will all make sense as I wrap up. I have had the opportunity to enjoy the Arts for most of my life. I have always enjoyed singing and I have always appreciated good Music and Literature and Art. As I was brought up I was always told by mentors in areas I pursued that a gimmick might get you attention but true excellence will create a legacy. I work in the city of Branson, and I really like this town. I have been a part of it for over 20 years now and it has been home to me for a very long time. I have witnessed some truly inspiring things while I was here. Glen Campbell performing Amazing Grace vocally and with bagpipes was something I will never forget, and I know it inspired others as well. Jim Stafford, amazing comedy and guitar picking, makes the audience roar and and then sit in awe all at the same time. some of the things I witnessed him do with a guitar just blew my mind. I even had the ability to see Paul Revere and the Raiders in Branson, Missouri. Every time they performed a new song I found myself saying I didn't realize that it was them who did those amazing tunes that I remembered singing as I was growing up. No one will ever forget Andy Williams and what he brings to Christmas time. He will certainly be missed, and I know the Branson audiences miss him and the crowds he brought in to see him. It's got to be hard for a family show in Branson to compete with a lot of this, I mean, these other guys made it big outside of Branson and have had the opportunity to bring that here. A family show like The Presleys or Baldknobbers don't have quite the same publicity pull to bring people to them. So, with that you probably have to do some things that are a little off the norm for some of these others. I believe the Dutton Family tried to get some attention on America's Got Talent, Some of the other shows have pulled some of their talent from American Idol performers in addition to other similar shows. Now it seems that the Baldknobbers has decided to come out with a show called "Branson Famous"
This show follows the Mabe family as it struggles to fight for relevance in a new world of entertainment that is passing them by. It's been the fodder for review writers from Variety, AVClub, and the New York Times. They even seem to get attention from The Soup which definitely brings attention to Branson as a city. If we go back to the comment I made before about a gimmick getting attention this would certainly fall under that category. My question is, did they create a bad storyline because it's similar to the mediocre talent that the show truly reflects or is it just poking fun at the town in general? Either way I don't really feel like this negative attention is something that a struggling community of Family Shows really needs. 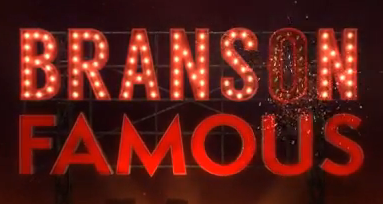 Without real talent base this show has really drawn a lot of criticism, but the worst part is when people see this they see it as a reflection of what Branson truly is. Joel McHale compared the show to the "Stench of a Tire Fire". I spoke pretty harshly on Facebook regarding "Branson Famous" and how the Oscars wouldn't be giving them any kind of award for excellence. I got a comment back inside of five minutes saying that they wished I hadn't picked on them because they represent our city. Frankly, I did let them have it for exactly that reason. The funny part is the younger generation of Branson folks came out and talked about how they are embarrassed to tell folks they are from Branson when that show is mentioned. This kind of sophomoric gimmick is the last thing a town like Branson, Missouri needs in it's corner. One of the more vocal marketing reps for the city (The aforementioned Facebook post) also stated that the last thing Branson needed was someone like a Madonna or Lady Gaga to come to our town because it didn't represent us. Did anyone see the pure excellence at the Oscars last night when Lady Gaga blew up the stage in celebration of Julie Andrews? What Branson really needs is for our old way of thinking to pass to the side so that we can stop accepting mediocrity as a standard in Branson. Fabulous talent like The Presley's and Six don't need the reputation of a show like "Branson Famous" hanging around their neck like a rusty cowbell. When junk like that hits the airwaves it represents our Shows, Hotels, and Restaurants simply because they put the name of our town in it. The reason why shows like "Breaking Bad" and "The Simpsons" mention Branson is because people can connect that to the mediocrity that is reflected in the reputation. So, a show like "Branson Famous" is going to reinforce a standard that doesn't reflect that we have raised any kind of a bar for truly excellent performance. Louis Darby, a Branson Musician who has been in the game here since 1987 states, "The more the better. Get Branson back on the map. It's been said that even bad publicity is better then no publicity." I think this "Old way" of thinking is exactly what is hurting Branson and its reputation today. To the marketer that screeched we don't need the likes of Madonna, Lady Gaga, or Miley Cyrus in our town needs to remember that Glen Campbell and some of our other great performers had less than perfect reputations at one time. Maybe it's time for some ideas that embrace what Branson is truly about and stop accepting vocals that resemble a cat fight in a nearby alley. 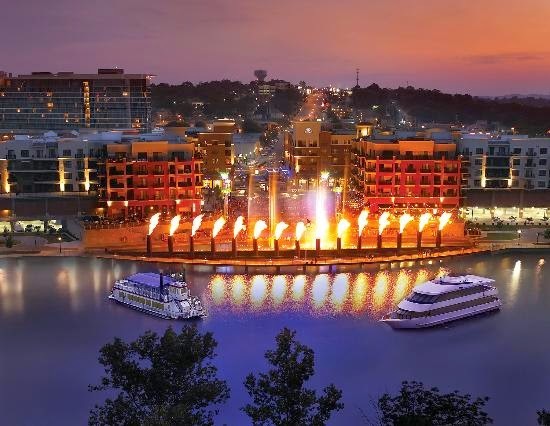 When I walked down the Branson Landing today I heard a Madonna song playing probably because that is something that people tend to enjoy listening to. The majority of restaurants play songs that include artists that some of our marketing people thinks would be a bad representation of the community. It seems it's here because that's what is comfortable for people. I was in Vegas several months back while I don't think gambling is our answer here I do believe that the showmanship is of a whole different level and we have a ways to go to compare - Just Sayin'. If a mediocre gimmick is all a family show has to offer anymore to the city perhaps it's time for that family to decide if it's really helping the community or if this is just something that is designed to be a last gasp of a dying show. It's not fair to hang that around Branson's neck. Too many of us really love this town and are inspired by what is really good and can be again if we focus on bringing excellence to the forefront. I'd love some dialog here, because I know I don't have the only opinion that counts in the community. As a Dad and a Marketing Professional I have interest in my community. I know others do to. I look forward to hearing from you. I have been a Christ follower for quite some time. Through the early stages of my life there was a desire to be a Minister. I worked hard to get there, and I felt that I had something to offer because God had put something special inside me. It was where I belonged. As I continued other things happened in my life and I made mistakes - things I am not proud of. When that happened I stepped away from full time Ministry because it felt like the right thing to do. More than being considered a lapsed believer I thought it worse to be considered a hypocrite. I knew that whatever I did I didn't want to deal with consequences of representing him in that position. I remember one time that a Preacher stated that people didn't come to church because there were hypocrites there. He said that was as silly as people not going to the Hospital because there were sick people. This is true in essence, but at the same time I really feel that the Church uses the same mindset to hide behind it's imperfection thinking that there is no harm for the fact that they remain where they are in certain areas. Even though they are so often quick to condemn those that aren't as good as they are in some areas. I admire passion in someone regardless of what they believe or profess. I heard Glenn Beck say recently. "Working with people is not bad - becoming what you fight against is. " I meet a lot of people in the industries I am involved in and I hear a lot of ideas. I can appreciate where they come from regardless of whether I believe in their viewpoint or not. What frustrates me is people who hide behind a veil of Christianity but still think it's okay to behave the way they do. To be completely honest much of the reason I don't attend a Church service regularly isn't entirely laziness (I am sure that accounts for some of it.) I will also admit that my most recent experience with a Institutional Body of believers left me pretty burnt. A group I know I tithed to for at least two years. I attended a congregation that was recently credited with over 10000 members. However, it seems when the lady who was my wife at the time walked out on me (Granted it was time for us to split) not one member of that giant congregation in Ozark, Missouri cared enough to call or check on me once. I did get letters from them talking about things I could give money to, but never was I contacted. I am thankful for my kids that there was support for them. I was married to a woman that would talk about God and then find ways to keep my kids from interacting with their half brothers. Actually, to this day she still does. However, now they also aren't really able to interact with their Dad either. So much they just don't know and never seemed to care about. This is simply my experience of late. I realize that not all Churches are like this, and not all Christians are the same. However, there is a large group of people that deal with this aspect of things in Churches everyday that contribute to the reasons why songs like "Take Me to Church" by Hozier are written. Christians don't want their kids listening to songs like that and I am sure it's because often kids might call parents on their actions. However they will often tell their kids that they are protecting them from filling their heads with corruption. Music like this is probably not a product of one's imagination; their is usually a reason behind the message. If you don't know what corruption looks like how is it you can fight against it? I appreciate the passion in the lyrics of the song I posted, and it made me think. I like that. The majority of Christians aren't doing anything intentionally to hurt the name of God. However little things happen that deteriorate that name on a regular basis. Are you blatantly out beating up people because they are different than you? Maybe not, but are you occasionally overheard at Starbucks taking jabs at people who may not be their to defend themselves. Often this conversation ends with God Bless 'em or let's pray for them. This isn't helping the name of the Church and you are leaning on the fact that you are imperfect to justify continuation of such a behavior. I wait tables all the time, and it's amazing what a guy with pretty decent hearing will hear in a restaurant. Jesus was pretty clear in how important treating other people is. Luke 11 talks pretty clearly about social responsibility as opposed to just doing what is expected monetarily What you speak to others is a much more supportive message of where the condition of your heart is toward people. I am not here to condemn anyone but it seems that people would view the Church differently if people would change the way they represent Christ. Maybe opening your mind up to something a little different might give you a different world view. Be careful of what you endorse as a Christ follower because people are always watching. I would love feedback. please use the comment section or shoot me an email. I appreciate ideas and I would love to know if any of this is something other than an item to take up space on the Web.